Have decided to do some more home brew experimentation. I have to confess that I have not grown any of the fruit products in this concoction. All of the fruit in this experiment is frozen fruit, from the frozen food section of a value supermarket. The Gin is also the cheaper stuff from that particular value super market. Blueberries apparently work better when they have been frozen, so we shall see. Notoriously difficult to grow, I don’t have blueberries on the plot for that very reason. At the back of the picture, the rhubarb vodka awaits decanting. More on that later. On the left, the jar contain black forest fruits. Blackberries, red and black currants, grapes and sour cherries. The jar on the right, contains blueberries. Both have a generous helping of sugar. I’d say about 250g of normal granulated sugar. In addition, i have added coriander seeds and cinnamon. Especially for the blueberries. I was surprised as to how popular a combination blueberries and coriander actually was. 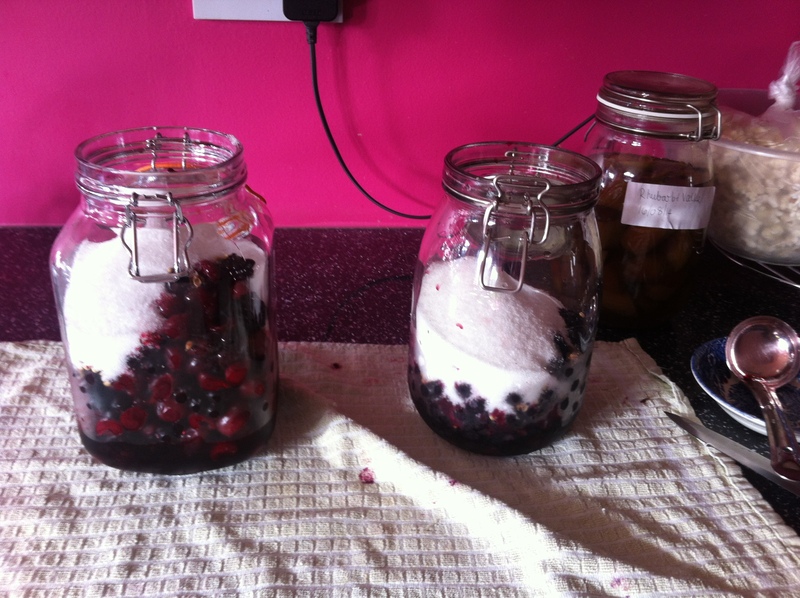 Both jars were then filled with 70 cl each of the gin. Shaken vigorously and stashed into an airing cupboard. There they will stay for six weeks, but will need to disturbed regularly for the first week, and then once a week. I think you are missing something in that last sentence. Be? Looks pretty exciting to me. Have never done Gin before. Yet another pink concoction. Even the blueberries were pink.